The foundation of any sustainable land management practice is an understanding of the underlying ecology. After all, once we understand what drives weedy plant abundance and distribution, we're able to identify choke points in the life of these plants to more effectively manage them. While other labs may focus primarily on the underlying ecology of such plants, our goal is to link knowledge of ecology with improved management. 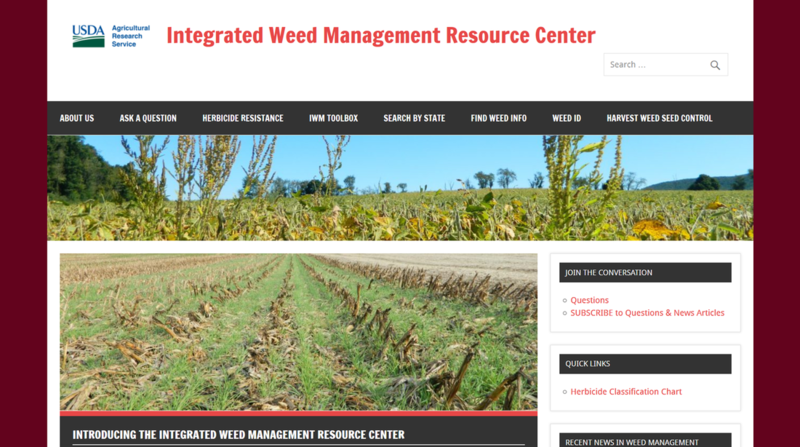 As part of a USDA Agriculture Research Service Area-Wide program, we contribute to a national educational effort on the use of diversified practices for herbicide resistant weeds called the Integrated Weed Management (IWM) Resource Center. This program can be found at www.integratedweedmanagement.org. The site features a clearinghouse of IWM resources, a weed management question & answer forum, and weekly articles on innovations in IWM. For more information, contact Annie Klodd. Work in the lab has grown increasingly spatially explicit, which is to say that spatial context has a strong influence on the dynamics of plant populations. Over the past five years members of the lab have been in the field mapping the floristic composition of fields, forests, riparian buffers and field edges in the agroecological matrix. With heightened concerns about the decline of managed honey bee colonies, our lab has been studying the association of the local flora and commercial and wild bee abundance and diversity. This work aims at designing productive and economically sustainable cropping systems that are less dependent on external inputs by optimizing internal ecosystem dynamics. These systems can then provide multiple ecosystem services, such as good weed management, reduced soil erosion, and better nutrient management. Our lab is also interested in designing resilient cropping systems that can withstand the challenges posed by climate change. Mortensen Lab Cover Crops 2016 from Christian Mortensen on Vimeo. One of the main ongoing projects on this topic is the Cover Crop Cocktails project. This is a multidisciplinary project funded by USDA (OREI) in which soil scientists, entomologists, plant scientist, farmers, and extension agents work together to understand the benefits and trade-offs of using cover crop mixtures. Mixing cover crop species has the potential to diversify the benefits provided by cover crops and increase the services farmers get from them. The ﻿video on the left ﻿highlights some of the research being conducted with cover crops within our group as of the Fall of 2015. For an overview of the whole project and some of the main results as of summer 2014, see our webinar. You can also contact Dave Mortensen or Barbara Baraibar for more information. Another project our lab is involved in is a USDA five-state project investigating Precision Zonal Management Systems (PZM or "ridge tillage systems"). In theses systems, crop rows (typically corn and soybeans) are planted in the same location year after year to create functionally-distinct zones on decimeter scales: the furrow and the ridge. These zones may differ in decomposition and mineralization rates, potentially isolating aspects of soil building from production, in space and time. Research is being conducted at the University of Illinois, the University of Minnesota, Michigan State University, and Pennsylvania State University. Faculty members from University of New Hampshire and Brigham Young University are also involved in the project. You can find more information on the project here or check our publications list. Katy Invasive Plants from Christian Mortensen on Vimeo.